Thanks for the good reading- learned a lot here. Problem: slow and uneven heating from my hot water baseboards. 1st floor is warm and cozy, and the 2nd floor is usually cold. Some of the bedrooms are fine, other bedrooms piped further away are cold. Baseboards are properly sized as per heating company I called for help. 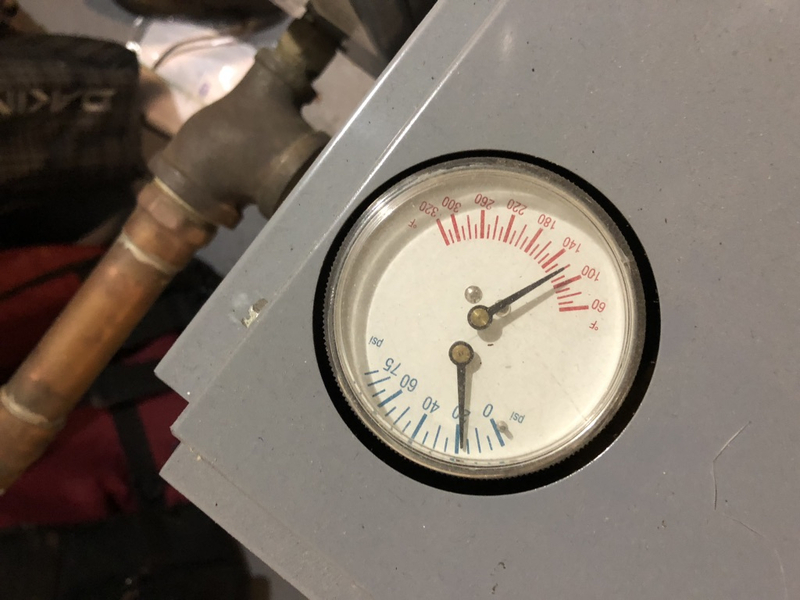 My system uses an 8-14 year old NG boiler, connected by 2 1/4 copper into some 3" gravity cast iron pipes The circulator pump on the return side of the boiler only runs while the boiler is firing, not before or after. 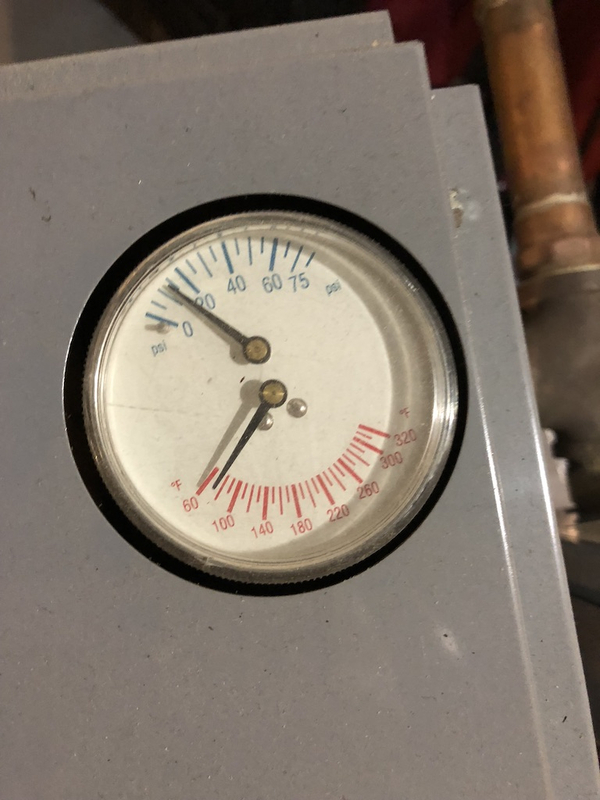 My observation is that for about the first 20 minutes the boiler is running, none of the baseboards are very warm except the shortest runs from the boiler, and most of the heat goes to heating up those giant cast iron pipes. My intuition is that you'd want the circulator to run well after the boiler has stopped firing to keep moving heat through the baseboards, but the aquastat only has a 2-wire on-off to the thermostat. Wanted to repipe the basement with aluminum barrier PEX onto the 1" copper pipes which run to the rads. Should speed up rad time-to-temp. Also wanted to install zone valves and a new aquastat w/ zone controller, maybe doing primary-secondary piping. Had a couple estimates- came in high (over 7500). 1st guy didn't want to remove cast iron piping because they heat the basement. I mentioned primary-secondary piping and zoning and he said my boiler can't handle primary-secondary since it's a big cast iron combi. 2nd guy suggested installing thermostatic valves on each rad and/or adding minisplits to each room which can help the baseboards heat. 1.) Is repiping basement with O2-barrier PEX a terrible idea? Want to save some headroom too. What size is good? 1"? 2.) If i want to zone my system, what's the best way? Primary-secondary, or just a zone-control panel and and zone valves and my blow torch? 3.) alternatives like thermostatic valve on each rad or minisplits - opinions? Can you bring the pics over here and post them? Couldn't get the files to open. How about some pics of your rad's including any valve on them? Read my current post about a gravity conversion for some answers to your questions. It sounds as though someone has replaced cast rads with baseboards in a gravity conversion. That won't work well, as you have found out. @Ironman has the answer. 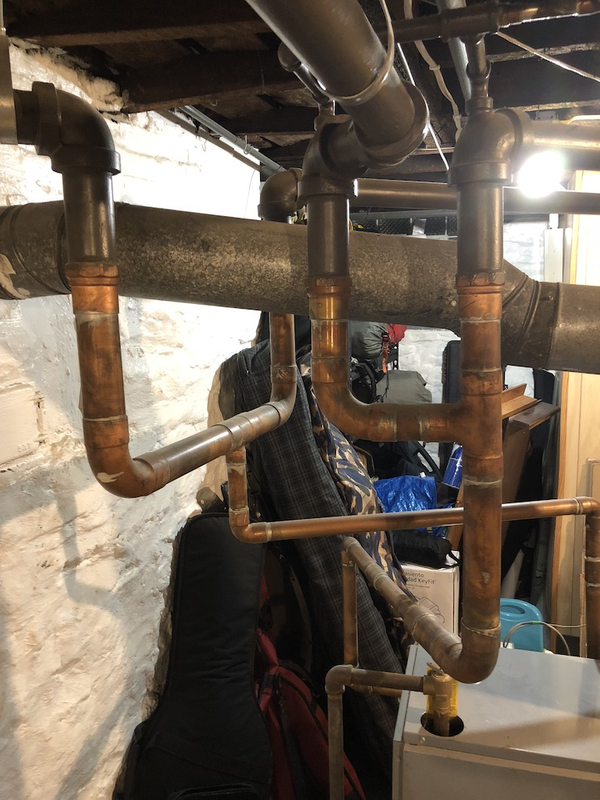 You need to lose the large pipes from the gravity system, run new home-run piping(pex) with manifolds. It's the only way you'll ever balance the system. 1) Make sure you are not air locked... meaning is the upstairs bleed on the main and at each radiator? 2) What's your system pressure? Should be at least 10psi at the basement., or upstairs could be sucking in air through a leak, or a auto vent. 3) Do you have balancing valves? Before you just to repipe the system, maybe you just need a few balancing valves on each loop. 4) I don't see why an oxygen barrier PEX wouldn't be OK. Have better insulation value too. I've been using it when i re-piped domestic water lines and used it for recirculation loop at my last house. ... also I'd wonder if the circulator is too small or too big. What is your supply and return temps? what temperatures are you running. Cast iron radiant is designed for a 20F delta T at the radiators and boiler. Both will balance when the flow rates are correct. Really, both emitters and the heat source are more closely coupled that people realize when it all works together properly. 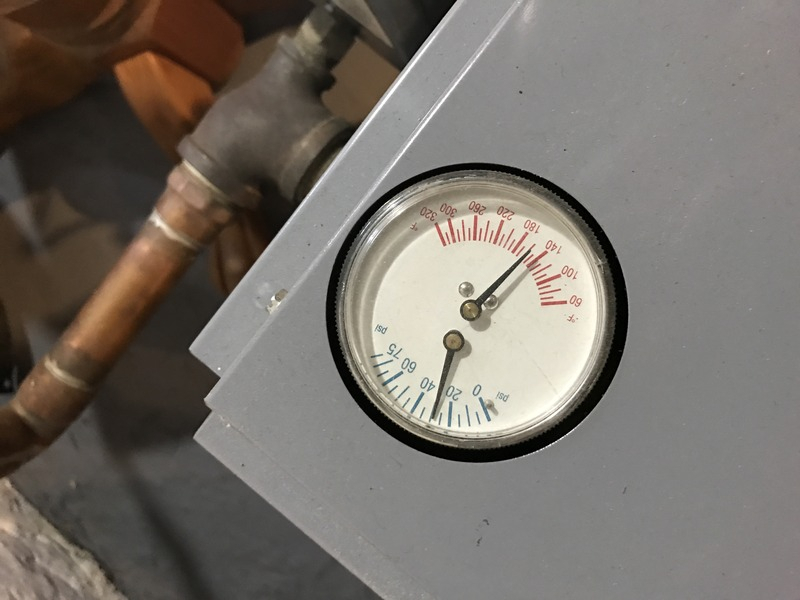 Is there a boiler bypass installed to protect from boiler thermal shock? Is it needed? Sorry for the delayed response; had another key thing fail: car! The photos are attached- I'll work on getting pics of my baseboards but they are huge base-ray cast iron guys with manual valves - hand turn. I've tried to show the supply/return but it's a mess of copper as you can see. During recent renovation I noticed that there used to be standup rads (ancient subfloor has holes cut for them), so yes it must have been a conversion. Not airlocked, but could probably use a bleed. Each rad gets hot. No balancing valves in the system that I'm aware of. To be clear - the 1st floor gets plenty warm, and one of the bedrooms (mine) does too. Now that we have live-in relatives and a kid, we're discovering the other two bedrooms are ice cold. A compounding factor is a finished (but shockingly uninsulated) 3rd floor which has *no* hot water heat but an electric baseboard, which is usually off, so it's icy cold up there. Here is a pic i took last year of the system after it had been running for a while. Seems I lost some pressure since last winter. If you have valves on the downstairs rad's, you need to turn down to where they're 1/4 to 1/2 turn open. 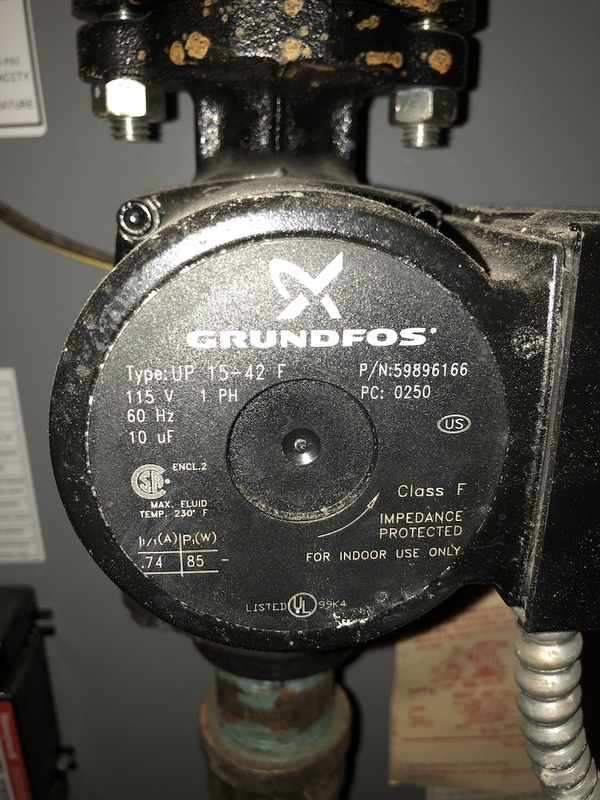 When the system was originally piped for Gravity flow, the installers would usually run smaller risers to upstairs and/ or put orifice plates in the valves of the upstairs rad's. The reason was to restrict flow to them because the hotter water would have less boyancy and want to go upstairs leaving the downstairs rad's starved for flow. When water is pumped, it will take the path of least resistance which is NOW through the downstairs risers and rad's since they're larger and shorter than upstairs. In essence, pumping the system has reversed the flow characteristics from what it was originally. You need to get more resistance downstairs to force more upstairs. 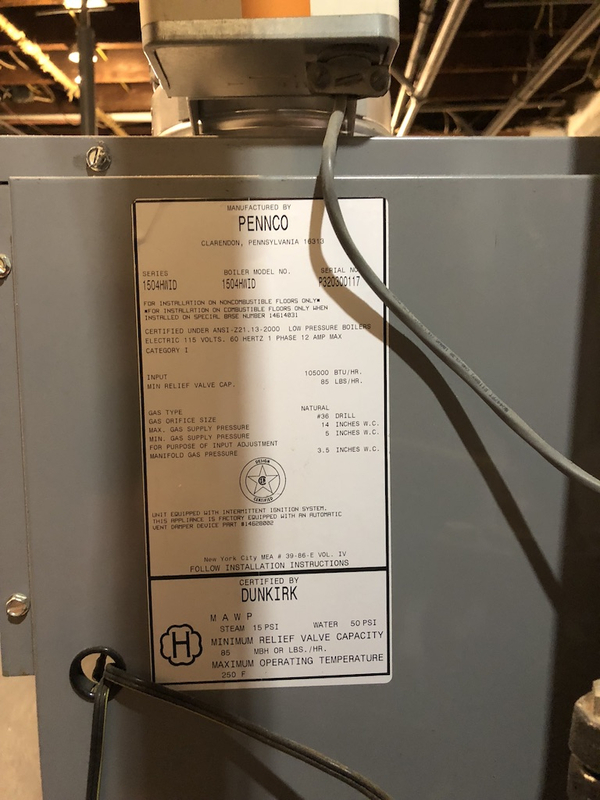 It would also help if the circulator was moved to the supply side "pumping away" from the PONPC (expansion tank connection), instead of towards it. But try closing down the valves first. thanks so much for the suggestion. I'm going to give the valves a shot and see if the relatives feels warmer tonight. Anyone know of someone great with hydronic in the pittsburgh area for the repiping job? who isn't afraid to lug out these monster 3" cast iron pipes? I'm pretty handy but boy those pipes were installed by manly men. I'd also like to relocate the boiler if possible, which would mean relocating gas lines and the flue, which I *really* can't do by myself.